Hero+Shero Journeys is a series of artist engagements organized and supported by IDEAS xLab to raise student awareness of environmental justice health issues using arts and culture strategies. Four artists created separate curriculums using science+art for students to design their own Hero+Shero Journey. 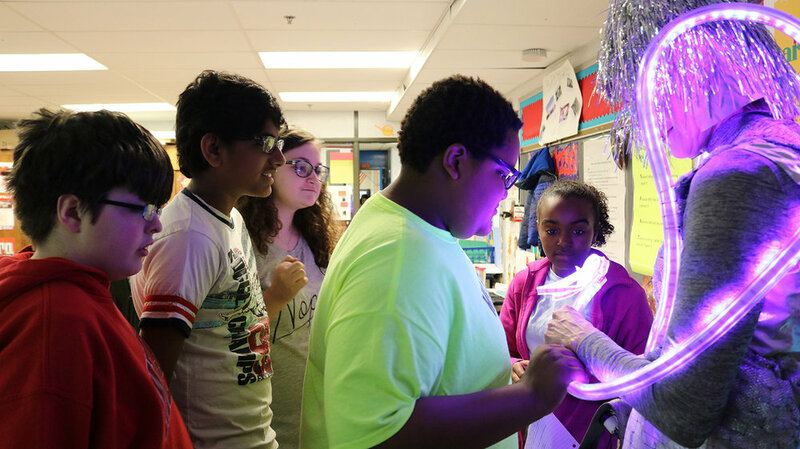 The in-class project was led by spoken-word artist Christopher Rasheed, a sixth-grade creative writing teacher at Meyzeek Middle School in the Smoketown neighborhood of Louisville, KY. Participating artists included: Dominique Paul (Air Quality Dress), Todd Smith (Diverse Ground and Poetry Jam), Andrew Thuita (One-Minute Film Festival on Water Quality). Brianna Harlan produced the Smoketown Hero+Sheros Comic Book and co-created the storyline and character designs with students. Advisors for the soil and water projects were Kurt Mason, District Conservationist with the National Resources Conservation Service for USDA and Gordon Garner, past Executive Director of Louisville Metro Sewer District and current president of KY Waterways Alliance. This comic book serves as the presentation document describing the journey Super Heros+Sheros would take to use their powers to create a healthier neighborhood through civic engagement. The story features the next steps identified by students that could become a foundation for a new policy initiative. IDEAS xLab would like to thank the Jefferson County Public Schools Board of Education, Principal Chris Burba at Meyzeek Middle School, and teacher Chris Rasheed for their support of the Hero+Shero Journeys Project. 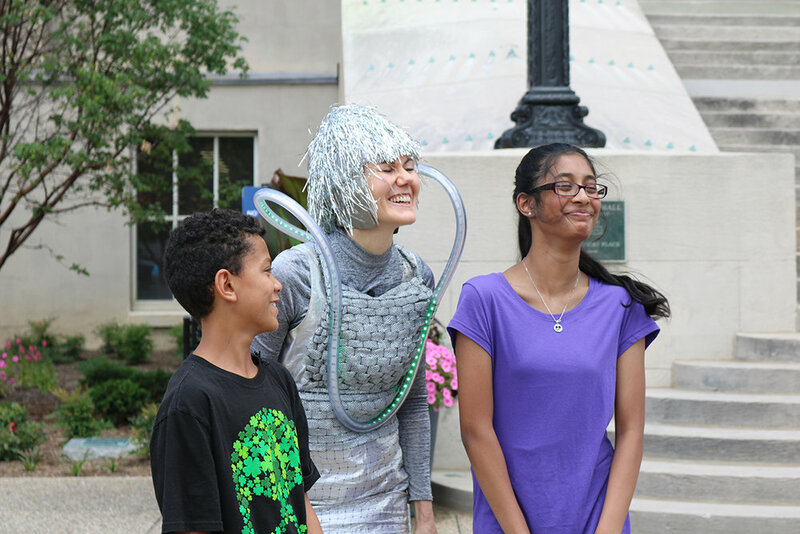 Canadian Artist Dominique Paul created the Air Quality Dress using an AirBeam (air quality monitor) to visualize surrounding air quality through LED lights worn as part of her handmade wearable art piece. 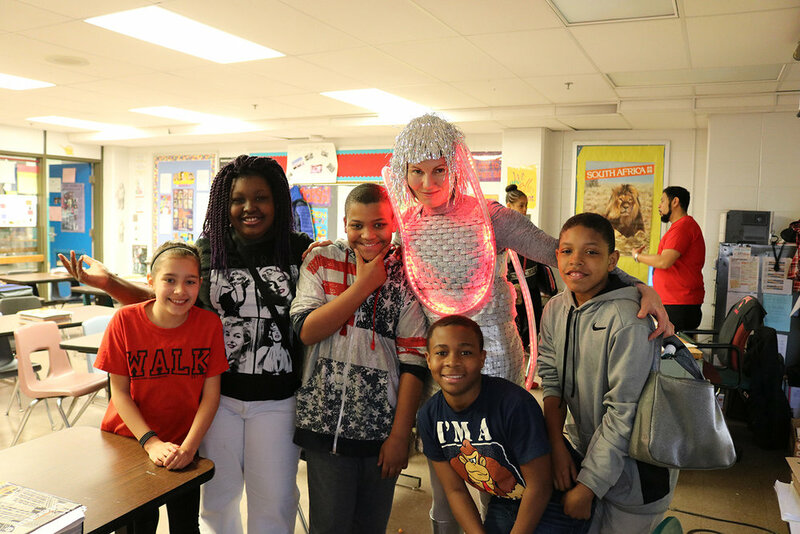 Over two weeks, Paul utilized the Air Quality Dress to engage Meyzeek Middle School students in discussions and research about air quality and the impact of unhealthy air on asthma and other breathing illnesses. In partnership with teacher Christopher Rasheed, creative writing, research essays, drawings, poster presentations and a short play were all developed exploring the many facets of air quality and asthma. In June 2017, Paul worked with the Institute for Health Air Water & Soil to lead an air quality walk in downtown Louisville with Meyzeek students, their families, and other members of the community. The walk was free to the public and an active demonstration of the Air Quality Dress, concluding with a community discussion at Metro Hall about Louisville’s air quality. 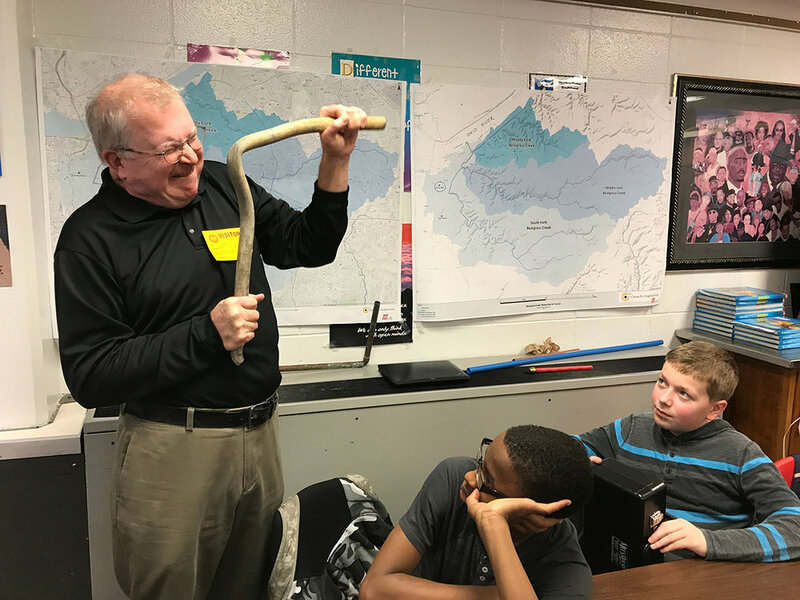 Louisville artist, environmentalist, tree climber, and teacher Todd Smith’s soil-focused project Diverse Ground was created under advisement by Louisville's Kurt Mason, Lead District Conservationist with the National Resources Conservation Service for USDA. Through Diverse Ground, Meyzeek students will learn to collect and analyze soil samples from their school property and a nearby neighborhood urban farm. After making soil milkshakes with the samples, paint chips will be utilized to create a large color-coded soil map of the settled soil. Using arts and culture strategies, the students will analyze the soil and explore the connection of soil to community health through poetry and rap. The final class session will be a Poetry Jam in which each student will present the poems they have written which will be incorporated into the soil map. Independent filmmaker, Louisville artist, and teacher Andrew Thuita worked with advisor Gordon Garner, past Executive Director of MSD, president of KY Waterways Alliance and Board Member of the Institute for Healthy Air, Water and Soil to design a water focused engagement for Meyzeek students. Classes will explore Beargrass Creek on the eastern edge of the Smoketown neighborhood and test the water to learn why people should neither drink the water, swim in the creek, nor eat the fish. Andrew Thuita will use his filmmaking skills to teach students how to make one-minute videos addressing the challenges of the creek's ecosystem and the human decisions that have rendered the water unsafe. The final class session will be a student led One-Minute Film Festival featuring each group's videos. Students will submit their best videos to the KY Waterways Alliance for possible selection to the Wild and Scenic Film Festival which will be held in Louisville in March, 2018. Brianna Harlan is a social practice artist, photographer, engagement coordinator with the Center for Neighborhoods, writer, blogger, businesswoman, and an alum of Meyzeek Middle School. Working with team members of IDEAS xLab, Brianna will introduce students to the process of civic engagement as they work together to create a Super Hero+Shero comic book focused on a student identified environmental justice issue regarding the health of Smoketown's air, water or soil. Spoken-word artist Christopher Rasheed, is a Louisville KY native who graduated with a MA in Teaching and Communication from UofL. He has been teaching for 16 years and has worked with youth in the community for the past 30 years. 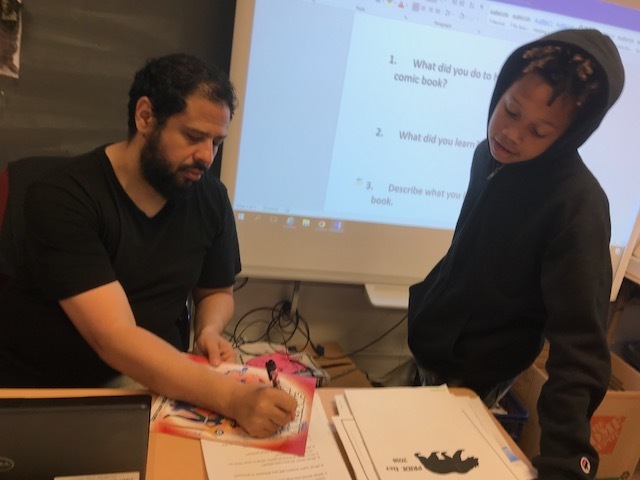 Rasheed is the creative writing teacher working with 6th graders in the Hero+Shero Journeys at Meyzeek Middle School. He is also the recipient of NPR’s The Moth Story Telling slam.